I had about 20 minutes to make breakfast before the guys came up from the barn this morning……..yes, they are extremely spoiled! Ha! Between my mother-in-law and I, they get a hot breakfast every morning. Of course, when they’ve been working since 4:00am, they’re pretty ravenous by the time 8:30 rolls around! I was tired of the usual bacon, ham, or sausage deal when I opened the fridge and remembered that I had some chicken breasts that I needed to use before they went bad. Thus, the birth of the chicken biscuit! I didn’t measure out my ingredients so here’s my best estimate for the recipe. 🙂 They were delicious! Start heating approx. 1/4 inch of oil in the bottom of a small skillet. Cut chicken breasts into 1 1/2 inch (or smaller) chunks. Beat egg in small bowl. Stir together the flour, powdered sugar, salt and pepper in another small bowl. Dip chicken chunks into beaten egg. Roll chicken chunks in flour mixture. 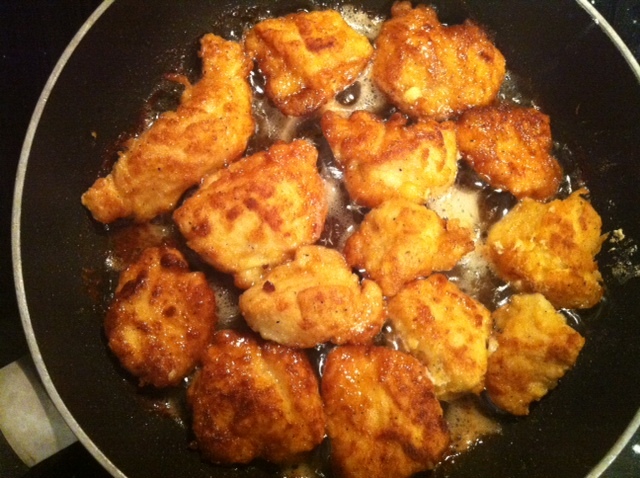 Fry floured chicken chunks in oil until deep golden brown and cooked through (approx 10 – 15 min depending on size). Serve on your favorite biscuits! ← Naming Contest: Help Us Name Our Holstein Heifer! I’m curious as to why you added powdered sugar? And would you add that again the next time? Could you taste it? Connie, I added the powdered sugar because I wanted a touch of sweetness since these were for breakfast. I first got the idea from this recipe, http://www.mynameissnickerdoodle.com/2011/03/fabulous-food-friday-79.html, that I saw on Pinterest for a copy cat Chick-fil-a recipe. I don’t think you can taste the powdered sugar. It just adds a slight hint of sweetness to the chicken. It’s even better if you have time to marinate the chicken in a milk/egg mixture for an hour or two first, but I didn’t have time for that! Sounds yummy…and perfect for those of us who get tired of bacon or sausage for breakfast. I love chicken but, I never would of thought of having it for breakfast. This sounds and looks great! I will have to try chicken for breakfast now. Thank you! I’m flattered! 🙂 The guys weren’t too sure about chicken for breakfast at first, but they warmed up to it quickly! OH man! This sounds great! Even IF chicken is a dirty word on this farm/ranch!!! LOL!